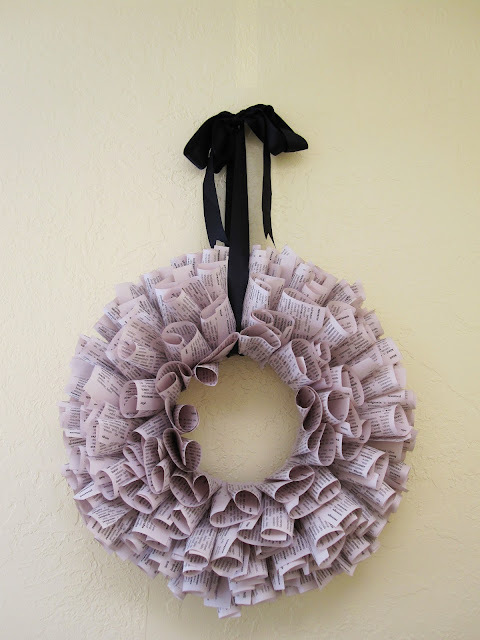 I have been wanting to make one of these Upcycled Book Page Wreaths ever since I found Lindsay’s blog. This one now lives in my dissertation/harry potter room -which is still being assembled- and I love it. I put this togher a while ago when I was still sicko and blah and feeling too tired to trust myself to sew without having to worry that I would screw something up or let my finger get too close to the needle. It took me one movie to finish it. Yeah I know judging time by the length of a TV show or movie is a clear sign of visual-audio-multitasking addiction, but hey that’s how I roll. It’s really easy just a bit time consuming and even then, it’s not that much time. Rip out pages and separate. Roll or fold one page and gluing while you do it so it holds it’s shape and glue the folded/rolled page to the wreath. 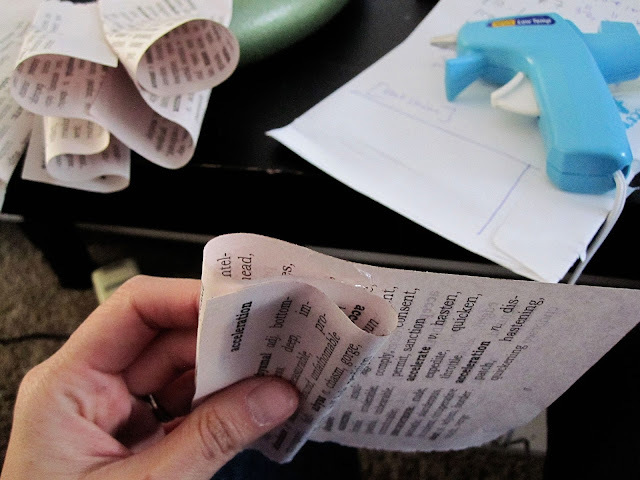 Repeat, gluing pages around the bottom of the wreath. Flip the wreath over and repeat on the top. Fill in the middle and then look at the wreath and fill in any spots you may think need more. You’ll probably want to put more in the center. 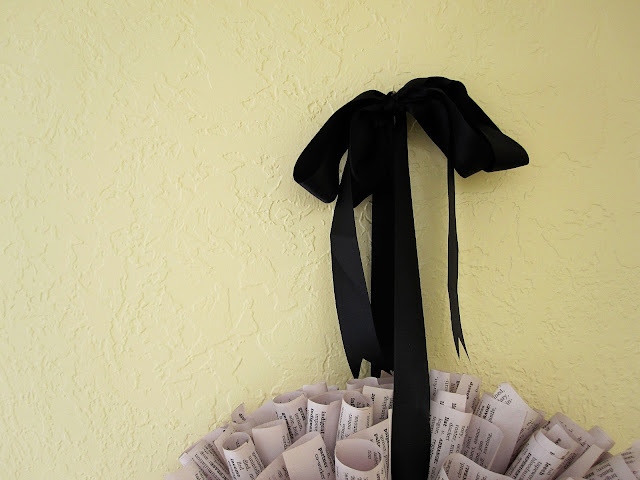 Loop your ribbon around the wreath. Tie a bow. If you want a double bow like mine, after the first bow is tied take the tails of the ribbon and tie another bow and you’ll get the double bow look. Hang, enjoy and feel like the smarty pants that you are since you have incorporated literature in such a clever way into your life. See Lindsay’s tutorial here. She even has a video of rolling the pages so if you’re still confused that might help. It’s one of those things you just need to do and you’ll get the feel of it. I love that it is a Thesauras. Maybe it is crazy, but I feel like I’d hang it somewhere near where I write so I could actually use it from time to time! Love this idea! And that little outfit on your header is soooo adorable. I’m such a sucker for ruffles! I would love for you to come link up to my Sew Crafty Party ! You did a great job – I have Lindsay’s tutorial bookmarked but haven’t tried it yet. I want to try this! so original. I love it. I was already intrigued by the wreath…but then I read you have a Harry Potter room =O Off to sticky beak now! I did the cone version of the upcycled paper wreath! Isn’t it fun? Yours looks fabulous! I love this!! It looks really neat! Nicely done, it turned out fabulous! very cute…adding this to my list of stuff to make!! 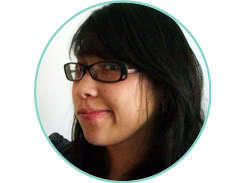 :) found you via tip junkie and following your blog!! Lovely book page wreath! Thanks so much for sharing at the Tuesday To Do Party! I love your wreath! It looks great and makes me want to read a book at the same time :) I feature it on my blog today. I hope that’s OK! 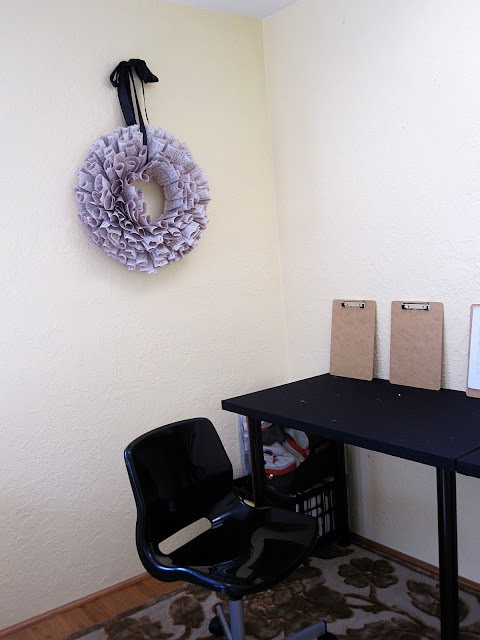 lovely wreath and I love that it’s from repurposed material! thanks for sharing, Marissa! What a great little blog you have. so pretty and really perfect for a creative space! I LOVE this! It would be PERFECT in my office! My best friend is a writer, so I KNOW she will be thrilled to see this idea! I am so glad I found u at Robin’s All Things Inspired party! I am your newest follower and I would LOVE for you to link this up to my Inspire-me Mondays Blog Party at Homemaker in Heels! Have a great week! Thanks for linking to Creative Juice. Hope to see you back again this week! 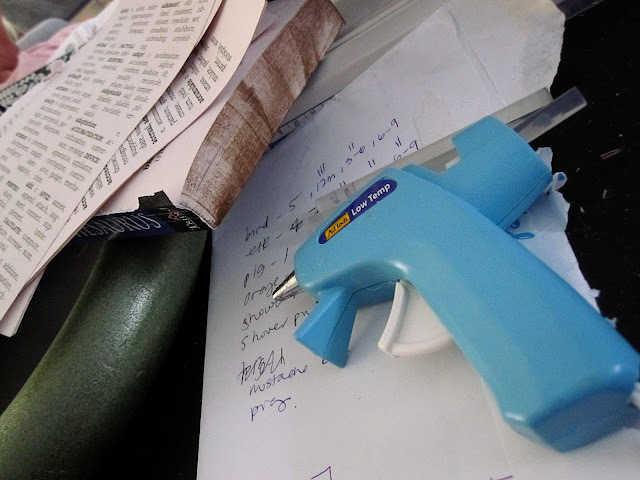 Thanks for linking up to Make & Share. You’ve been featured! Stop in and grab a feature button in my sidebar. Hope to see you tomorrow for the 5th edition. So beautiful!! In the first pics it looks lilac, which I looooove! Are these pages purple or is it just the pic and the colors of your walls (yellow is the compliment of purple). Does anyone know a simple way of dying pages of a book easily?